Apple’s most direct competitor in the future won’t be Microsoft or Google, but Amazon.com. With the release of the Amazon Kindle Fire, Amazon.com declared war directly on Apple’s core business model, which is to sell integrated solutions for the consumption and creation of digital content. Starting Thursday, Apple strikes back. My unified theory of Apple: It’s primarily a content consumption and creation company. Apple devices do all the standard things that phones, tablets, laptops and desktops do, but Apple’s secret applesauce is that iGadgets are optimized on the low end for “consuming” content, and on the high end for creating it. Apple’s unique business model is to profit from the hardware, profit from the software and profit from the delivery of content to those integrated hardware/software devices. If you understand this basic fact about Apple’s uber strategy of focusing on content, then it’s easier to predict what the company will do. In a nutshell, Apple’s goal is to do for all content what it did for digital music — control it. In order to control digital content, that control must be wrested from established players. Music was easy, because the recording industry was naive and clueless. By the time they realized Apple was out to control their industry, it was too late. Other media will be harder. The only way for Apple to take control of TV, movies, books, magazines and newspapers will be to destroy many of the companies that currently dominate those industries — by eliminating them and enabling content creators to sell their works directly to consumers via iTunes. It’s called disintermediation — the removal of intermediaries who stand between the Mac-using content creators and the iOS-using content consumers. Fortunately, for Apple, the destruction of old-school intermediaries like TV and movie studios and publishing companies is going to happen anyway. The broad trend is in Apple’s favor. We already have an idea about how Apple intends to control the future of video content. The rumored iTV, if successful enough, could put Apple in a position to dictate delivery, and also business models — a la carte, for example, instead of the prevailing cable model. TV is the one major content consumption device that isn’t made by Apple, and soon Apple will fix that. When they do, the iTV or whatever will ultimately cut out the cable companies and deliver everything over the Internet. It turns out that the very company that has declared war on Apple is the same company that currently controls book publishing. It’s pretty hard to imagine Apple putting up an Amazon.com-style bookstore and competing head-to-head with Amazon for print book sales. It’s not going to happen. In fact, Apple did launch a bookstore that competes in a limited way with Amazon’s eBook offerings, and that hasn’t been exactly what you might call successful. Amazon appears untouchable for book sales. But in fact that company is far more vulnerable than it appears. Amazon sells two kinds of books (I’m oversimplifying for the sake of clarity). The first kind of book comes from the traditional publishing industry. Harper Collins does its thing, develops a book title and sells a hardcover edition and Kindle edition, then later a paperback and audiobook. Even though there are products consumable on iOS devices, namely eBooks and audiobooks, it’s still produced through traditional intermediators. The second kind of book comes directly from authors. There’s no publishing company involved. Amazon offers the option of itself serving as the intermediator, offering publishing-like services, including design, editing and all the rest. Or authors can hire their own freelancers to do that work for them. Authors for this kind of book do their own marketing and distribution, and Amazon offers help with those efforts as well, for a price. This is the disintermediated model. The dominant type of book on Amazon from a revenue perspective is the first kind, the kind produced by the traditional publishing system. The second kind of book is a much smaller business. That’s today. Tomorrow, the relative importance of these two kinds of books will be reversed. Publishing without a publisher is the future of publishing. Apple will never compete with Amazon.com in a soup-to-nuts online bookstore scenario, where the core competency is making deals with every book publisher in existence and managing incredible inventories of paper books. That’s not a business Apple wants to be in. But the future of books — self-published authors selling electronic books to be read on digital devices. Well, that’s an Apple business. In other words, Apple won’t compete with Amazon for the present of book publishing, but for the future. And Apple has one massive advantage over Amazon.com in the world of self-publishing: A disproportionate percentage of authors use Macs. All things being equal, authors would choose to work with Apple rather than Amazon. And they’re not equal: Apple is already better than Amazon at creating the tools for creating books. Apple is already the hardware platform of choice for both designers and authors. Apple makes word-processing software and communications software. In fact, every aspect of the disintermediated book publishing model falls squarely into Apple’s core competencies. I think Apple intends to slowly take control of the book publishing industry from Amazon by providing the leading tools and cloud infrastructure for authors to create and then market their books directly to readers. Starting with the education segment of the publishing market. Which brings us back to Thursday’s event. I think we can expect to see the beginnings of a system that connects textbook authors to students. Between those two Apple-using connection points lies writing, editing and other types of creative collaboration, design, layout, and more. The textbooks of the future will be cheaper and more frequently updated. They’ll be annotatable by teachers or customizable by school districts and universities. Although Apple may initially partner with textbook companies, ultimately textbook publishers will be pushed aside because they’re too slow and inefficient. In other words, I think Apple will begin the long process Thursday of reinventing the textbook industry as a stepping stone to eventually reinventing the entire publishing industry. In addition to re-inventing the textbook industry, I think Apple will re-invent the textbook. The obvious way to do this is to integrate multimedia. Because textbooks will be conveyed as iOS apps, they’ll have video, and audio, worksheets, interactive quizzes, “flash card” functionality and much more. Starting with textbooks makes enormous sense for Apple. The company has always emphasized the education market. Schools at all levels have taken to iPads in a massive way. 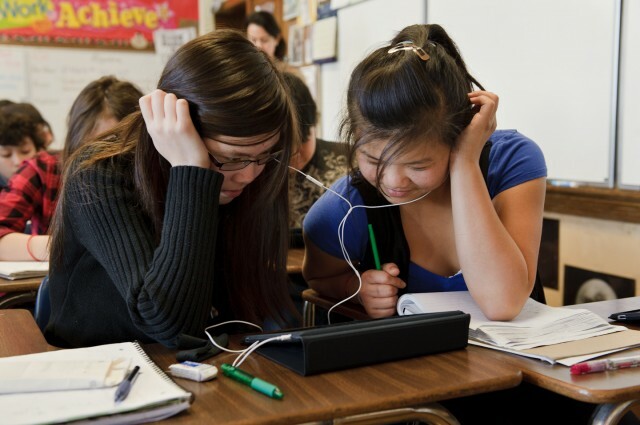 Re-inventing textbooks to be read on iPads will be something welcome by students, teachers, school districts and universities. As part of Apple’s effort both to serve the education market and also to clobber Amazon.com, I think Apple will announce sometime this year, possibly Thursday, a 7-inch iPad (widely rumored) and sell it at very low cost to undermine the attractiveness of the Amazon Kindle Fire. I also wouldn’t be surprised if Apple offered new special discounts for bulk purchases of iPads to schools. I believe that whatever Apple announces will be a step — larger or small — toward controlling the textbook market by enabling the disintermediation of the industry — the removal of publishers, printers and others from the supply chain. One step is winning the customers — the schools, teachers and students. A second step is winning the suppliers: The writers, editors and others. And a third step is connecting the two with a publishing system that turns the content creator’s words, pictures, videos, audio, designs and other materials into a polished, marketable interactive eBook. Despite the long goal of disintermediation, I think there’s a very good chance that publishers may be involved in Thursday’s announcement. One possible baby step is to convert existing textbooks into iPad apps and eBooks. That would be the quickest way for Apple to establish itself firmly in the market. By the time Apple has transformed the high end of the textbook market, they’ll be ready to go after books in general, which will by then also be ready to go it alone without publishing intermediaries and will also be ripe for multimedia. The familiarity with Apple’s publishing systems in academia by students, teachers and professors will ease their entry into the bigger publishing world. Writers tend to go to school. And this is yet another great reason to start the conquest of publishing with textbooks. An alternative scenario is that in addition to a program to corner and reinvent the textbook market, Apple may also offer publishing tools for authors to sell iBooks to the general reading public as well. But no matter what specific programs and products Apple announces Thursday, you can be certain that Amazon.com won’t like it. Amazon has always been in Apple’s long-term path by selling electronic content in the form of Kindle books. They challenged Apple even more directly when they provided an alternative to iTunes with music, movie and TV downloads. But the aggressive launch of the Amazon Kindle Fire tablet put them directly in Apple’s way as Competitor Number One. Thursday’s Apple event has been billed as an “education” event. And I have the feeling that Apple is about to take Amazon to school.